Porth Nanven is a small cove situated at the end of the sylvan Cot Valley, not far from St. Just. The long sweep of the Cot Valley is famous amongst bird watchers, particularly in autumn when storm-driven vagrant species frequently turn up after being pushed across the Atlantic Ocean. Cot Valley is not quite as ravaged by mineworkings as neighbouring Kenidjack Valley, although many remains are present. The valley is equally famous amongst landscape and seascape photographers for the small cove of Porth Nanven, where the valley opens out at the seaward end. This small cove and it’s large round, pebble-like boulders is an oft-photographed iconic Cornish location. West-facing and open to the Atlantic Ocean weather systems, sunset and evenings are usually the best times for landscape photography here. The light and the cloud formations can be very dramatic after the Autumn Equinox, especially on an incoming tide. The location almost begs for neutral density filters and long exposures. The sea is often restless and that is a vital ingredient for those ethereal, misty effects. A 10 stop neutral density filter will be one of the most useful filters to have to hand and 2 and 3 stop hard graduated neutral density filters will be needed when there is a good sunset. On my most recent visit, the sunset, although very promising only minutes earlier, was lost to blanket cloud. At our latitude, that isn’t so much of a problem if, like myself, you like the cold blue tones such conditions will bring. End-of-the-day landscape photography in the UK doesn’t need to be only about yellow, magenta, pink and cyan pastel hues. Blanket cloud can have a certain drama of it’s own with a wide angle lens and a 10 stop nd filter. West-facing usually means photographing directly into the wind and with a long enough exposure, clouds will usually ‘streak’. This image shows the beginnings of cloud streaking, as picked-up by the 20 second exposure time. 20 seconds is not really a ‘long exposure’ compared to some of my work, although it was just enough to calm the boisterous sea without making it completely flat. Porth Nanven is one of those locations which require you to return to again to try different things. One thing that is guaranteed is the potential for dramatic images. 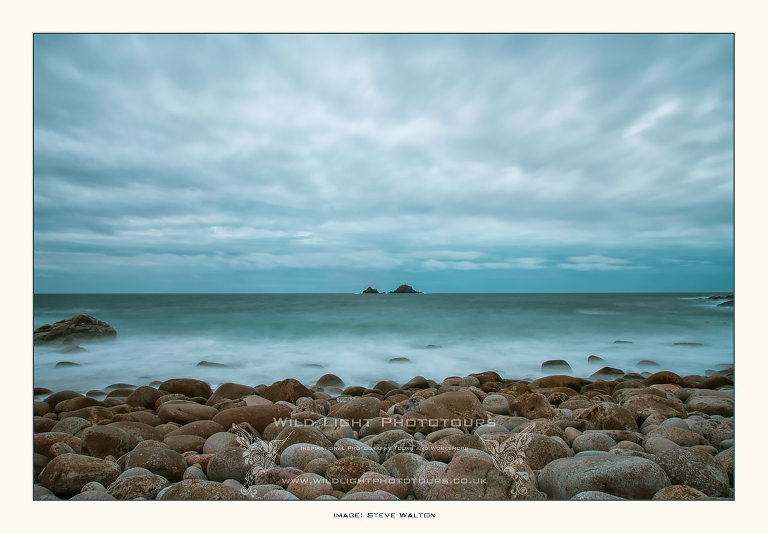 Porth Nanven, overcast evening. Nikon D810, Nikon 20mm f1.8G Formatt-Hitech 10 stop irnd filter.